It was an unfamiliar losing feeling for Liverpool at the Etihad Stadium on Thursday. The Premier League leaders missed the chance to open up a nine-point gap to Tottenham and 10 over Manchester City, thanks to a 2-1 loss at the latter. 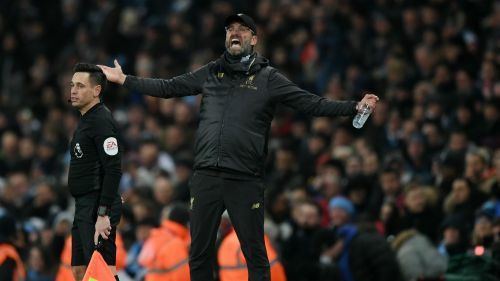 Jurgen Klopp's men had not been beaten in the league this campaign until making the short hop to Manchester and they must now find a way to bounce back with City – who are now second – just four points back. Here, we take a look at their record against each of their next five Premier League opponents. The Reds return to league action before City, heading to Brighton a week on Saturday. Klopp's men have won all three of their Premier League meetings against the Seagulls and they triumphed handsomely on their visit last term, running out 5-1 winners with Roberto Firmino scoring a brace. Brighton have not beaten Liverpool in any competition since 1982 and, as admirable as Chris Hughton's side are, it is hard to see that run coming to an end this month. Liverpool play before City again the following weekend, meaning the champions will still be chasing. Palace are the visitors to Anfield and Liverpool have won 58 per cent of the Premier League meetings between the sides, although this curiously drops slightly to 56 per cent for the Reds' home games. Liverpool have won their last four Premier League games against Palace, though, conceding just once. But Reds fans will not have forgotten how their 2014-15 title tilt under Brendan Rodgers crumbled at Selhurst Park, where a 3-0 lead was somehow squandered in the last 11 minutes. City head to Newcastle the day before Liverpool host Leicester, who shocked the champions last month. Liverpool have won seven of their 12 Premier League games against the Foxes, including the last four, although Leicester have scored in the three most recent of those defeats. That shows forwards including Jamie Vardy will pose a threat. The former England striker gave Leicester a third-minute lead at Anfield last term, but Mohamed Salah struck twice after the break to turn the game around. Salah's brace secured all points as #LFC came from behind to beat @LCFC in a hard-fought Anfield encounter. City's first February game is at home to Arsenal, with Liverpool heading to West Ham a day later. Liverpool have won on 11 of their 22 Premier League visits to West Ham and Klopp's men have put four past the Hammers' defence four games in a row, so their recent record in this fixture is very strong. Senegal forward Sadio Mane could be a particular threat for the Reds in this game as he scored twice when West Ham were battered 4-0 at Anfield on the opening weekend of the season. In the last round of league games before the Champions League returns, City host Arsenal the day after Liverpool welcome Bournemouth to Anfield. The Cherries have faced Liverpool seven times since winning promotion to the Premier League, winning only once, and they have fallen to heavy defeats without scoring a goal in their last three meetings. Salah hit a hat-trick in a 4-0 demolition of Eddie Howe's side in December and the Egypt superstar also scored in both games against Bournemouth last term.